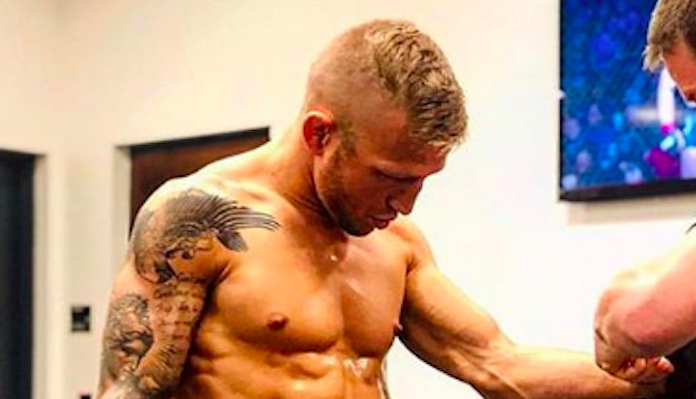 The nutritionist and strength and conditioning coach of TJ Dillashaw has released a statement on the former Bantamweight champs positive drug test results. The coach, Sam Calavitta, released the following statement (via ESPN’s Brett Okamoto) shortly following today’s news that TJ Dillashaw had been suspended two years for using EPO. “It is with a heavy heart that I, Coach Cal, the owner, found and purveyor of The Treigning Lab, Ben recently seen the defeat of one of our family members in recent months. This defeat is not due to the skills and combat savvy of an opponent of flesh, but rather a defeat at the perilous hands of a far more sinister foe; the demon of self doubt which haunts each and everyone of us at one time or another in our lives. TJ Dillashaw was suspended two years for his positive test and will not be eligible to return until 2021. ← Midnight Mania! If TJ Dillashaw was on EPO when he knocked out Cody Garbrandt, should Cody’s title be reinstated?